Life is crazy busy. Chafuerring people to appointments, dealing with school holidays, and troubleshooting website redesign issues is what this week has been like so far. This is all on top of my backlog of normal work and household duties. Needless to say, I don’t have the time to really relax — like run away to a pool sipping a margarita kind of relax. SO I have to take what I can get. Here are some quick and easy ways to reduce stress and relax in 5 minutes or less. Aromatherapy is all the rage these days. You can’t turn around without someone trying to sell you essential oils. I have to be honest, I’ve jumped on that bandwagon — well using them anyway. I love using them in DIY crafty type projects around the house. Did you know smells change our mood?. That’s why I love candles! Lately, I’ve been enjoying The Time Collection by Yaasa. 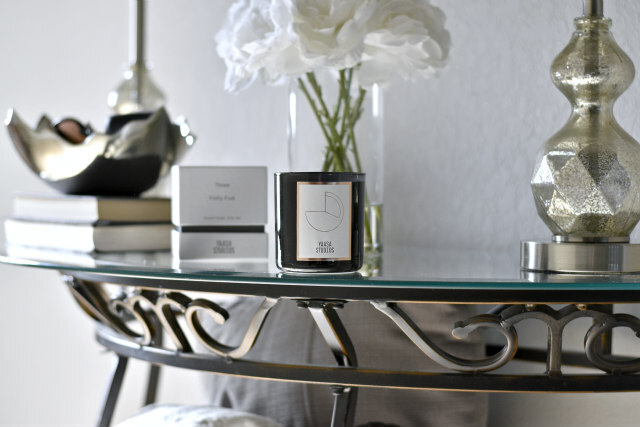 Each scented candle in this collection is cleverly named after a time. I received a Three Forty-Five and Eight Thirty candle and boy do they smell amazing! Want to pretend you’re at the beach when you have deadlines breathing down your neck? Then this is the candle for you! It features an oceanic fragrance with hints of citrus, sea water, and sage. Need to relax with a romantic candlelit glow? 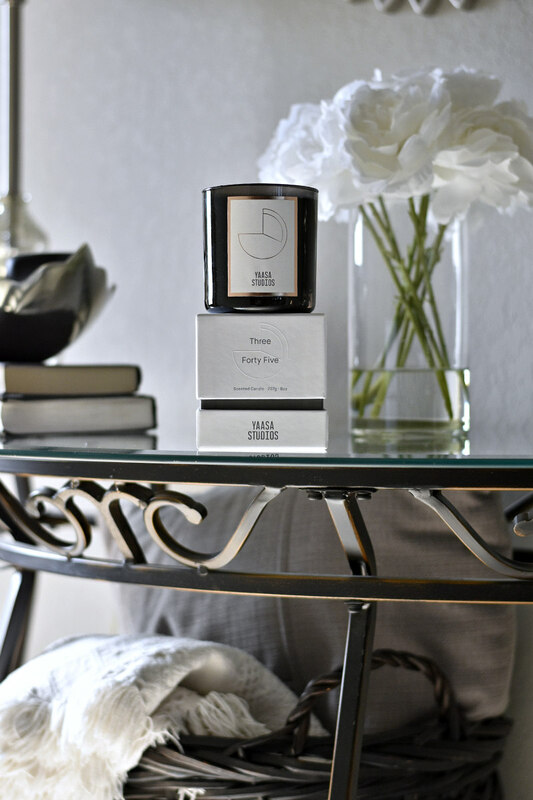 This candle tosses around scents of gardenia, jasmine, and ylang-ylang. They will intrigue your senses and calm your mind. These candles are amazing. I can literally burn one for maybe an hour and then the next day I can still smell it. Plus I love their color scheme. Champagne gold and black go with everything! Yaasa is a fairly new startup mainly known for their adjustable beds, desks, and amazing mattresses. As you now know, they also offer a couple of fun accessories like candles and blankets. I’m a big fan of the candles! 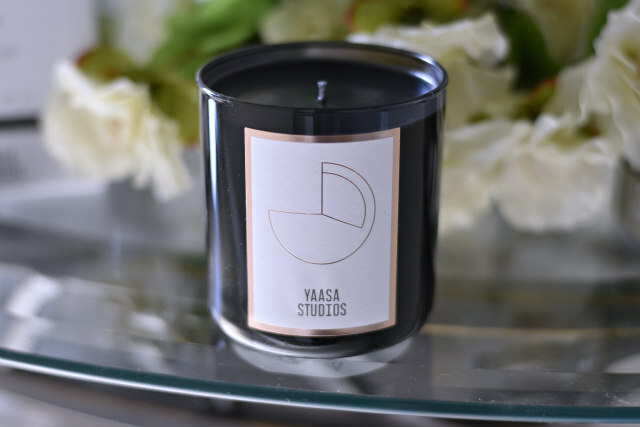 Such a big fan, in fact, we’re hosting a giveaway where you can win your very own Yaasa Studios 8oz Scented Candle. Winner gets to chose the scent. Hurry ends soon! Are you tense? Massages help increase the flow of blood and oxygen and plain just make you feel good. Since you’re DIYing it, start with your hands and feet. Grab some lotion and a small ball or two. Using the lotion, rub the muscle under your thumb. And, if you’re talented, at the same time, rub your feet back and forth over a small ball. Oh, yeah! Scalp massages are great too. I especially love them in the shower with my handy shampoo brush. Massages are great for quick stress relief and have even been known to lower blood pressure! We all could use some alone time. I know this is easier said than done for most moms. But whenever you get the chance, run to your stress-free zone. FAST. I recommend your bedroom be your safe zone. Why? Because you already associate it with happy things like sleep. Make sure your room is set up with a super comfy bed and mattress like those from Yaasa. Yaasa’s sleep system allows you to adjust to whatever position is most comfortable for YOU. With just a click of a button, support can be where you need it most! Being alone for just a couple of minutes really clears my mind and allows me to collect my thoughts. Lay on your bed, close your eyes, and maybe meditate for a little bit concentrating on your breathing. Get up and run. It’s that easy! It’ll get your feel-good hormones pumping plus get you in shape. It’s a win, WIN! Writing can be very relaxing especially when you have something pestering your brain. Get it out — whatever is bothering you. Trust me, it’ll make you feel better. Whenever I am upset petting my cat always makes me feel better. It calms me, and it’s no wondering considering it can reduce the stress hormone cortisol. Plus it gives you more of those feel-good hormones everyone loves! The sun makes me happy! I just love relaxing by the pool in the summer (with sunscreen, of course). Sunlight is known to be mood lifting thanks to another feel-good hormone serotonin. All of the feel-good hormones should be bottled, right? Do you have any stress management tips to share? Great tips! I honestly never thinking to give myself a massage but that’s a great idea! I am definitely a person that finds a lot of relief in writing! Writing can be very therapeutic. I especially need it at night if I can’t sleep. These are great ideas. I love basking in the sun too! I love your ideas here, Sometimes I put a warm cloth over my eyes to help me to relax. Petting your animals is a great relief. It makes me happier too! Great ideas, I love walking. Walking gets me out to smell fresh air and I can think about myself and how walking makes me feel good. Walking is good. I need to get back to it. The weather has been so gloomy here we haven’t had the urge to. I love candles!! Now I just need a hot tub lol. I like to watch a funny youtube video/clip to relax. I usually laugh and feel better instantly! Does it help you relax if you aren’t alone? yeah, i have 4 kids and we are a connected parenting family, so often someone needs to come along. they are aware that thesetrips are relaxing trips and not “get me something at the store ” trips… i think it’s good for kids to see that you find ways to provide self care? Yes, most definitely. They will notice the need more as they age. 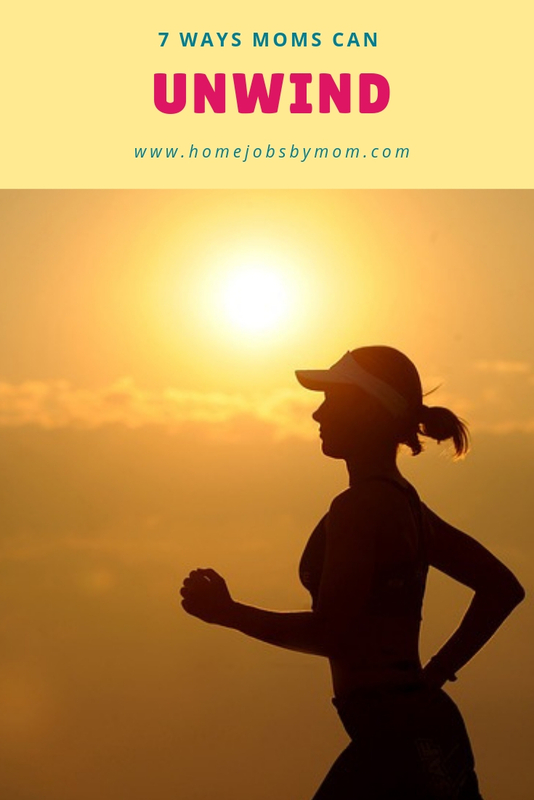 What can of exercise helps you with stress? I have a lot of trouble relaxing. Sometimes I will grab a large/medium to hard difficulty crossword puzzle and try to focus on it for at least 45 minutes. Its not for everyone but I find my stress melt away when I can focus on it instead. I’ll have to try that sometime. I haven’t done a crossword puzzle in forever. Is it classical that you listen to? That sounds like something my grandfather would enjoy listening to! I love to relax with a good book. A nice hot bath is wonderful also. I lke your points. I also like to read. That is a relaxer to me. What’s currently your favorite book? I know, right? PLEASE put me in time out lol. I use wax melting tarts in place of candles during the day. I like tarts too. Have you found any way to make the scent last longer? Reading helps relax me.I also listen to music to relax. Lol it’s a start, right? Got to get that ball rolling lol. lol, that can be relaxing and distracting at the same time. Score! Working out is my go to stress management! Some days that means weights, others cardio, but sometimes mama just needs a good 10min to get zenned out with some yoga. You sound like a very healthy person. I need to start exercise more! It’s been gloomy here too and I’m in Texas. I have had a lot of stress in my life lately. I try to carve out a bit of time for me when possible. What I love to do is yoga and then also knitting. I’m sorry your life is stressful right now. I hate when everything just piles on. Weaving & sewing were my “me” things but pinched nerve in neck has made those activities painful. Surgery for that in April but for now walks in the woods with dogs & cats are my relaxing time. Ouch! I’m sorry you pinch a nerve. That doesn’t sound fun at all. I hope your surgery goes smoothly! I find that when I’m upset about something, writing about it can help me calm down. Plus I’m more eloquent in writing so it helps me to explain why I’m upset to others. I keep trying to tell my son to do that when he’s upset. I’m going to get him a journal for Valentines Day and hope he uses it. I relax by turning off everything, have a cocktail, and listen to soothing music. Sounds very relaxing! What’s your favorite cocktail? I love to curl up with a good book to relax.I also enjoy listening to music to relax. I can relax easily by reading, especially if it’s a book I’ve already started. Another way for me to relax is to call friend & just chat. What book are you reading now, Judy? One of my favorite ways to relax is by taking a nice, warm bath. I especially love it when I have good smelling bubble bath or epsom salts. A good book is also always an awesome escape for a little while. I like to take a hot bubble bath to relax. I also like to burn scented candles and have a huge collection. Where do you buy your favorite candles? I stress easily, so I have to have some solid plans in place to relax and enjoy life. I write, I read. My room is my haven. Large soft bed with soft lighting. I absolutely love going out on our boat in the early summer morning, just as the sun is rising, the fog lifting off the water. It is relaxing to the max and I am filled with serenity after a day on the water. Taking a boat ride sounds very nice and beautiful! I can understand why you love it. I can relax by playing music. Another method is getting away from the urban noise or noise pollution. Music can be very relaxing depending on the beat. Take a warm shower after the kids are in bed is my stress relief typically. I also enjoy petting our cats or our bunny when it’s nice and quiet in the house. Awe, what kind of bunny do you have? My son is wanting one. Sounds like something I wish I was doing right now. Ha! I need to run or workout everyday to unwind and have time for myself. I also like to read. I need to workout more. Maybe I’ll try after I get over this sickness. I’m Type A to the max, so sometimes, I need to remind myself to just stop and breathe! I’ve also been trying to make it a point to think about WHY I’m all worked up and tell myself it will be ok. I also meditate. Not nearly as much as I should or want to, but I need to make myself sit and do that more because it does help. Do you have any tips for meditating? I wish I could get the kids to go to bed at 730pm lol. One goes to bed at 830pm but my oldest is usually 930-10 if I’m lucky. Candles are pretty great. I hope you get the much-needed rest you need very soon! I like all your ideas. My favorite way to relieve stress is to take a walk while listening to an audio book. Sounds like something my husband would enjoy or my son. They are always listening to podcasts. What book are you currently reading to relax? A long soak in a hot bubble bath helps me relax. To make it even better, I usually have a book or a new magazine to enjoy while I soak. It was a lot harder when I was still raising the 5 kids, haha but I’d sneak in at least short destress me time in as I could. There were days that just getting to pee in peace without kids knocking and yelling for me at the door felt like a mini-vacation. Haha. Now that we are empty nesters, it’s VERY easy and I do a variety of things often. 1. Cuddling our Oriental Shorthair cat & cockatiel & feeding, photographing and adoring birds & variety of wildlife in our yard & on the patio through the sliding glass doors and taking in the beautiful scenery while sipping coffee or tea is very relaxing. 2, Enjoying a massage from neck to feet in our indulgently wonderful treat of a massage chair in our bedroom. Helps me with migraines, anxiety attacks, insomnia etc too! 3. I feel very blessed that our apt complex has an outdoor and also a year-round indoor pool and sauna, here in Michigan and I LOVE using those and swimming laps relaxes me and puts me in a trance and doesn’t even feel like exercise, more like fun playtime. 4. I love listening and singing along to uplifting Contemporary Christian music or 60’s & 70’s music (I also like current pop & the 90s and early 2000 pop too). I love flower children type music I grew up to. 5. I love using self-hypnosis videos on youtube for pretty much anything under the sun. It’s healthy, relaxing and therapeutic. Wow, I love everything you do to unwind. And I love that you love all kinds of animals too. They help me relax too. For me reading a good book reduces stress. I also like using essential oils in my diffuser. Sounds like your dog is very comforting. What kind do you have?